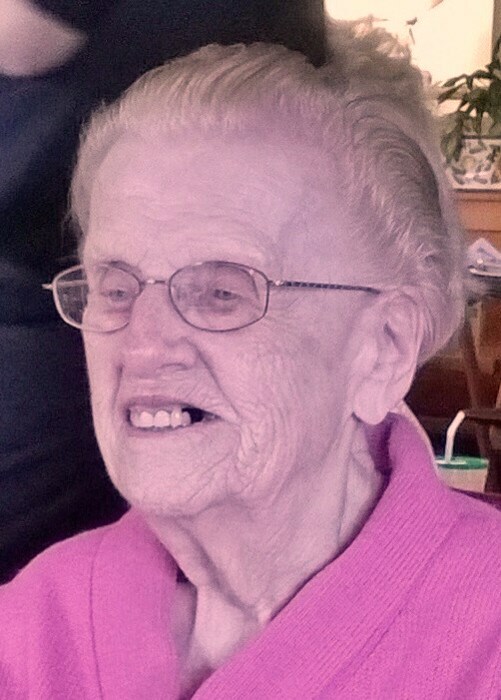 Margaret M. Schmitt, 97, of Streator passed away Wednesday, December 5, 2018 at her residence in Streator. Funeral services will be at 12:00 P.M. Monday at the Solon-Telford Funeral Home, Streator. Rev. Tony Ross will officiate. Visitation will be from 10:00 A.M. until 12:00 P.M. Monday at the Solon-Telford Funeral Home, Streator. Burial will be in Sts. Peter and Paul Cemetery in Leonore. Pallbearers will be her grandchildren, Doug and Nathan Schmitt; Dylan, Justin and Cameron Groesbeck; and Jeff Groesbeck. Born September 20, 1921 in Withee, Wisconsin she was the daughter of Frank and Josephine (Kemmerick) Fluech. She married Edmund P. Schmitt on July 3, 1944 at Immaculate Conception Church, Streator. He preceded her in death on October 3, 1992. She is survived by daughters, Carol (Bill) Wolf of Skokie and Sheila (Jeff) Burnette of Elgin; sons, Allen (Jeanne) Schmitt of Streator and Ronald (Ruth) Schmitt of Woodstock; grandchildren, Dawn (Jeff) Groesbeck, Douglas (Becky) Schmitt, Nathan (Mary) Schmitt, Donna (Jennifer Vance) Schmitt and Sean Burnette; great grandchildren, Dylan, Justin, Cameron and Nora Groesbeck; and Ella Schmitt; and great-great grandchildren, Chrissy, Kendall and Dawson Groesbeck. She was preceded in death by her husband; a daughter, Donna Schmitt; 4 brothers and 2 sisters. She farmed along with her husband in Eagle Township for over 40 years. She also worked for Anthony Company and later John and Joe’s Florist for over 24 years. She was a member of the former Immaculate Conception Church. She also volunteered for the LaSalle County Clinic with the SHARE Foods program.